July 7, 2017, Adrian, Michigan – At a time when many worry about the future of religious life, Sister Katherine Frazier, an Adrian Dominican novice, gave an encouraging vision of a new group of women who are responding to God’s call and facing their future as Sisters with courage and hope. Sister Katherine, who is at the Adrian Motherhouse for the summer, took the opportunity July 6 to speak to those on campus about her recent experience at the Collaborative Dominican Novitiate (CDN) in St. Louis, Missouri. “The [canonical novitiate] year was definitely a confirmation that this is the community where I belong,” she told the Sisters. Sister Katherine shared the experience with two novices from the Dominican Sisters of Peace: Sisters Ana González and Margaret Uche, as well as two Co-directors, Sisters Joye Gros, OP, a Dominican Sister of Peace, and Megan McElroy, OP, a Dominican Sister of Grand Rapids. The CDN was established more than 25 years ago to give novices of U.S. Congregations of Dominican Sisters a rich novitiate experience and a sense of the larger Dominican family. Currently, 17 Congregations participate. Sister Katherine recounted the novices’ busy weekly schedule: Morning and Evening Prayer together every day, worship at the local parish of their choice on Sundays, and ministry for four hours on Mondays. On Tuesdays and Thursdays, the novices attended classes at Aquinas Institute of Theology and at the novitiate, including a specific course on vowed life and Foundations of Preaching. Wednesdays brought them together with novices from a variety of women’s and men’s communities for prayer and workshops. Each week concluded with a day of reflection on Fridays and some free time on Saturdays to catch up on cleaning and other chores. Throughout the year, the novices also took turns cooking meals for one another and met weekly with their director as they continued discernment for vowed life. In addition, they hosted panels of Dominicans who spoke about their own experiences living out the vows of poverty, chastity, and obedience. Sister Katherine spent her ministry time at the Mary Ryder Home, which provides housing for older women who, for various reasons – including addictions, mental issues, and developmental disabilities – are unable to live on their own. “I helped them with various activities, such as games, and accompanied them on shopping trips,” Sister Katherine said, adding that one of the difficulties of the novitiate year was the limited time she could spend in ministry. “It was hard to be there for just four hours and to know that the needs were so much greater than I was able to provide for,” she said. The novitiate year also included key experiences that deepened Sister Katherine’s understanding of Dominican life and of the Dominican family: a trip to a motherhouse in Kentucky, which was the first U.S. foundation of Dominican Sisters; the Dominican Preaching Colloquium, sponsored by Aquinas Institute to celebrate the Order’s 800-year Jubilee; and a road trip that involved visits to several communities of Dominican Sisters in the East. Sister Katherine’s second year as a novice will focus on study at Catholic Theological Union in Chicago and community life with local Adrian Dominican Sisters. 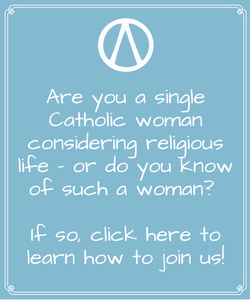 Watch the video of Sister Katherine’s presentation. 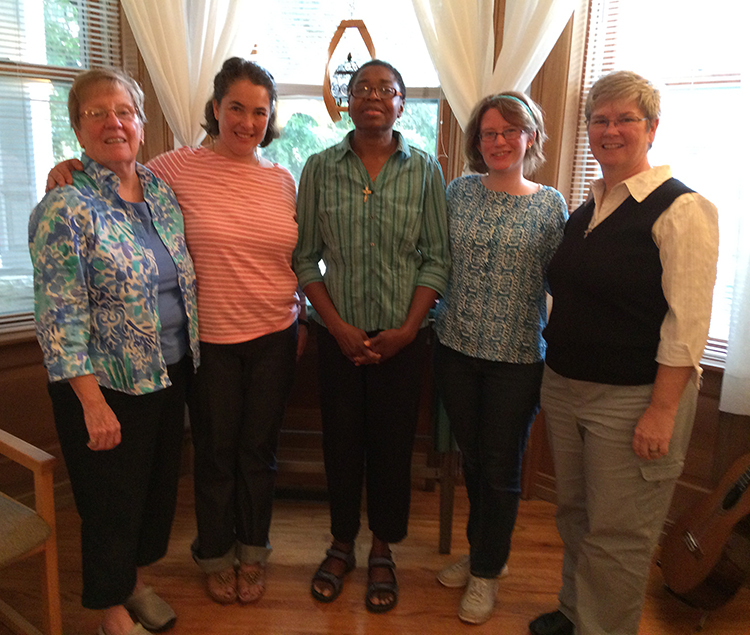 At the novitiate in St. Louis are, from left, Sister Joye Gros, OP, Co-director; Sisters Ana González and Margaret Uche, novices from the Dominican Sisters of Peace; Sister Katherine Frazier; and Sister Megan McElroy, OP, Co-director.